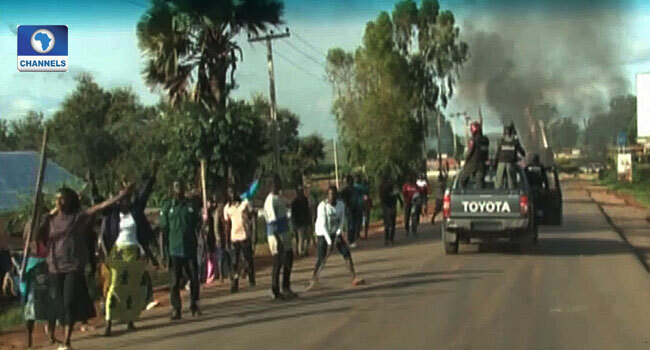 A scene of the attack in Plateau State. The Nigerian Army said on Thursday that they have arrested 17 people in connection with the killing of at least 100 people in the central state of Plateau. Army Spokesman, Major Adam Umar said three of the arrests were linked to killings in the Barikin Ladi area, while the other 14 were arrested in connection with the deaths of travellers in the south of the state capital, Jos. “We all know that some days back, some villages in Barikin Ladi were attacked and these three suspects were arrested in connection with that,” Umar said. “As our men were repelling the attacks in those areas, we arrested these three suspects with four rifles, three locally made guns and one AK47,” he added. The clashes are rooted in tensions over access to land between the pastoral herders and sedentary farmers but have also generated sectarian friction between Muslims and Christians. Police and army reinforcements have been sent to Plateau to improve security, while a dusk-to-dawn curfew remained in place in areas of the state to restore calm. At least 86 persons were confirmed killed by suspected herdsmen during the attack on Gashish district of Barkin Ladi Local Government Area of the state last weekend. The state’s Police Public Relations Officer, Mathias Tyopev, told Channels Television on Sunday that six people were also injured while at least 50 houses, 12 vehicles, and 15 motorcycles were razed. Several groups and individuals have continued to react to the resurgence, calling on the Federal Government to shake up the country’s security set up. One of such groups was the Christian Association of Nigeria (CAN), which has asked the Federal Government to review Nigeria’s security architecture in a bid to stem the rate of killings in the country.